Amyotrophic lateral sclerosis (ALS) is a late onset neurodegenerative disease with fast progression. ALS has heavy genetic components in which a series of genetic mutations have been identified. In 2013, Mutations of the CREST gene (also known as SS18L1), which functions as a calcium-regulated transcriptional activator, were found in sporadic ALS patients. However, the pathogenic causality and mechanisms of ALS-associated mutations of CREST remain to be determined. In this study, we constructed CREST knockout and Q394X knock-in mice with CRISPR/Cas9 system. Using biochemical and imaging tools, we illustrated core pathological phenotypes in CREST mutant mice and claimed the possible pathogenic mechanisms. Furthermore, we also observed locomotion defects in CREST mutant mice with behavioural tests. We demonstrate that ALS-related CREST-Q388X mutation exhibits loss-of-function effects. Importantly, the microglial activation was prevalent in CREST haploinsufficiency mice and Q394X mice mimicking the human CREST Q388X mutation. Furthermore, we showed that both CREST haploinsufficiency and Q394X mice displayed deficits in motor coordination. Finally, we identified the critical role of CREST-BRG1 complex in repressing the expression of immune-related cytokines including Ccl2 and Cxcl10 in neurons, via histone deacetylation, providing the molecular mechanisms underlying inflammatory responses within mice lack of CREST. Our findings indicate that elevated inflammatory responses in a subset of ALS may be caused by neuron-derived factors, suggesting potential therapeutic methods through inflammation pathways. Cheng et al. 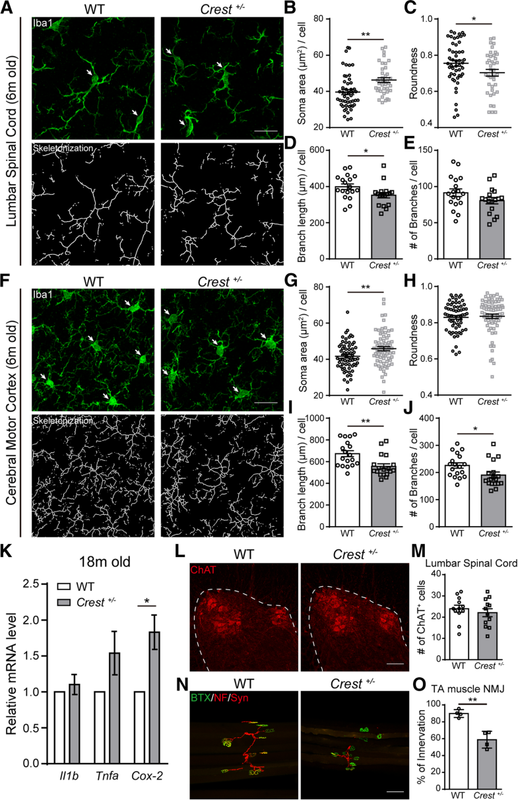 discover that neuronal loss of CREST reduces the protein level of FUS, de-represses transcriptional inhibition of chemokine genes which in turn causes microglial activation and proinflammation, and ultimately leads to axonal degeneration of motor neurons and impairment of locomotion. Amyotrophic lateral sclerosis (ALS) is one of the most severe neurodegenerative diseases characterized by the fast progressive degeneration of motor neurons in the central nervous system (CNS). Usually within 3–5 years of disease onset, patients suffer multiple symptoms including muscle atrophy, paralysis and respiratory failure, during which there are limited therapeutic approaches to alleviate disease symptoms. Moreover, clinical features of ALS appeared great heterogeneity, meaning that ALS patients may experience motor neuron death onset in different regions of CNS, such as the spinal cord, brainstem or motor cortex . ALS has heavy genetic components in which a series of genetic mutations have been identified. Since ALS-causing mutations in SOD1 gene were reported in 1993 , more than 50 ALS-associated genes have been subsequently reported, including TARDBP, encoding TAR DNA-binding protein 43 (TDP43) , FUS [4, 5], C9orf72 [6, 7]. With the development of next-generation sequencing (NGS) technology, many previously unknown ALS-linked mutations have been certified via whole-exome sequencing. Several de novo and inherited mutations in CREST have been recently reported in ALS patients via NGS-based whole-exome sequencing or target gene sequencing approaches [8–10], suggesting that CREST may be a potential ALS-causing gene. Among all the mutations, we focus on one de novo missense mutation, CREST-Q388X, which leads to a truncation that lacks nine amino acids in the C-terminus . CREST is characterized as a calcium-regulated transcriptional activator of which C-terminus is responsible for gene activation through interacting to CREB-binding protein (CBP) . Whereas the N-terminus of CREST protein has auto-inhibitory function via interacting with the chromatin remodeling BRG1 complex which in turn recruits histone deacetylase complex HDAC1 to inhibit gene transcription . Although previous study showed that both loss of CREST and overexpression of Q394X (the corresponding truncation of mouse Crest homolog) or I123M mutant blocked the depolarization-induced dendritic outgrowth in cultured neurons [8, 11], whether mutations of CREST lead to ALS-like phenotypes in vivo remain to be determined. Previous publications have demonstrated that non-neuron-involved chronic inflammatory responses play a critical role in the pathogenesis of ALS [13–16]. During neuroinflammatory responses, microglial activation, astrogliosis and infiltration of peripheral immune cells are the main observable pathophysiological hallmarks [17–24], and subsequent production of neurotoxic factors such as tumor necrosis factor α (TNF-α) and interleukin 1β (IL-1β) can deteriorate disease progression [25, 26]. 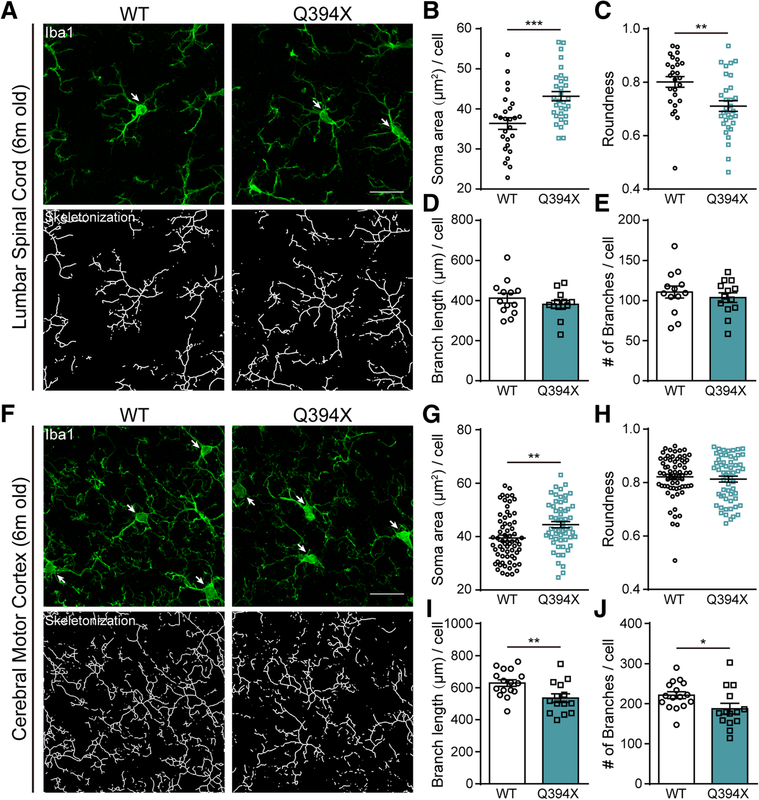 As resident macrophages in CNS, microglia perform the first defense line of innate immune system, and thereby the excess activation of microglia predominantly conducts sustained neuroinflammatory responses that contribute to the progression of ALS or other neurodegenerative diseases [27–29]. Taken together, we hypothesize that ALS-linked CREST mutations may contribute to the aberrant neuroinflammation in vivo which in turn causes ALS-like phenotypes in mice. In this study, we show the impaired protein stability of Q388X mutant compared to wild-type (WT) CREST in contrast to previous report . Importantly, we demonstrate that microglial appearance exhibits activated morphology including the enlargement of cell bodies and the decreased complexity of processes in both CREST knockout (KO) mice and homozygous Crest Q394X/Q394X (Abbreviated as Q394X) mice, suggesting that CREST haploinsufficiency or ALS-related mutation leads to microglial activation and sustains the proinflammatory state in CNS. In agreement with ALS-like phenotypes, we also show significant denervation of tibialis anterior (TA) muscles in CREST KO mice and locomotion impairment in both CREST KO and Q394X mice. Finally, considering the specific expression of CREST in neurons, we suggest that upregulation of two important chemokines, Cxcl10 and Ccl2, in neurons lack of CREST may contribute to inflammatory activation in CNS. Taken together, we demonstrate that neuronal loss of CREST function caused by ALS-linked mutation induces the alteration of immune-related genes expression which leads to microglial activation and sustained proinflammatory responses, which in turn impair motor neurons and motor behaviors of mutant mice. The human CREST coding sequence was synthesized and then subcloned to FUGW vector (Addgene Catalog #14883) with HA tag by enzyme digestion approach. We constructed the HA-Q388X mutant-expressing plasmid from HA-CREST WT-expressing plasmid with the KOD-Plus-Mutagenesis Kit (Toyobo) according to manufacturer’s instructions. The harboring vector of shRNA targeting mouse CREST or BRG1 is pFUGW-H1 empty vector (Addgene Catalog #25870). All the FUGW and pFUGW-H1 plasmids were packaged into lentivirus for high transfection efficiency in cultured primary neurons. The C57BL/6 Mus musculus was the experimental model in this study. All mice were maintained in a specific pathogen free (SPF) unit under constant temperature, humidity, ventilation and automatic light cycles. All genotypes, including CREST knockout and Q394X knock-in, used in experiments were confirmed by Sanger sequencing. CREST knockout and Q394X knock-in mice were constructed with CRISPR/Cas9 system on the genetic background of C57BL/6 mouse. The sequences of small guide RNA (sgRNA) for CREST knockout or Q394X knock-in mice and the repair donor for Q394X knock-in mice are shown in the Key Resources Table (Additional file 1: Table S1). All animal-involved experiments were approved by the Biomedical Research Ethics Committee at the Shanghai Institutes for Biological Science (CAS). The use and care of animals were in accordance with the guidelines of this committee. Cortices from embryonic day 15 to 16 C57BL/6 mice were digested with 20 U/ml papain (Worthington, LS003126) at 37 °C for 30 min. Cortical neurons were cultured within Neurobasal medium (Gibco, 21,103–049) supplemented with 2% B27 (Gibco, 17,504–044) at 37 °C with proper density. We performed lentivirus transfection the day after plating and replaced the medium 24 h after transfection. We collected neurons at 6 or 7 days in vitro for subsequent experiments. The protein samples were harvested from cultured cortical neurons with RIPA buffer, and mouse brain cortices and lumbar spinal cords were homogenized in RIPA buffer (containing 150 mM NaCl, 1% sodium deoxycholate, 0.1% SDS, 50 mM Tris-HCl pH 7.4, 1% Triton X-100 and protease inhibitor cocktail tablets (Roche, 04693159001)). We sonicated the lysates with 10 sets of 30-s pulses on ice cold and the lysates were centrifuged at 13,000 rpm for 10 min at 4 °C. The protein samples from the supernatant were run on 8–10% SDS-PAGEs at constant voltage and then transferred to PVDF membranes (Millipore, pore size: 0.45 μm). Blots were blocked in 5% BSA in PBS-Tween for 2 h at room temperature and then incubated with primary antibodies overnight at 4 °C. After washing with PBS-Tween, the blots were incubated with secondary antibodies for 2 h at room temperature. The protein bands were detected with chemiluminescence (ECL Western Blotting Substrate, Pierce, #32106). For cultured primary neurons, we aspirated the medium and washed cells with PBS. 4% paraformaldehyde (PFA) in PBS was used to fix the cells for 20 min at room temperature. After washing with PBS, cells were incubated in block buffer (3% BSA, 0.1% Triton X-100 in PBS) for 2 h at room temperature. Then cells were incubated with primary antibodies overnight at 4 °C, followed by the incubation of secondary antibodies for 2 h at room temperature. For acquiring brain and spinal cord sections, animals were perfused transcardially with PBS then 4% PFA. After fixation in 4% PFA, brains and spinal cords were cut 40 μm thick with cryostats sectioning of Leica CM1950. After washing in PBS, sections were incubated in block buffer (5% BSA, 0.3% Triton X-100 in PBS) for 2 h at room temperature. Then sections were incubated with primary antibodies overnight at 4 °C, followed by the incubation of secondary antibodies for 2 h at room temperature. All images were captured on Nikon TiE-A1 plus confocal microscope. When counting ChAT-positive motor neurons in lumbar spinal cords, confocal imaging would include an intact ventral horn of spinal cord which could show all motor neurons in half a section. Then we counted the number of ChAT-positive cells co-localized with DAPI. As for microglia imaging, we chose similar regions among all sections and counted Iba1-positive cells which could be discriminated easily. During quantitative analysis of neuromuscular junctions (NMJs), postsynaptic acetylcholine receptors were labeled with α-bungarotoxin (BTX) CF488A conjugate (green), motor neuron axons were labeled with anti-neurofilament-L (NF) antibody (red), and synapses were labeled with anti-synapsin-1 (Syn) antibody (red). The co-localization of green and red signals was considered as intact or innervated NMJ. We calculated the innervation ratio per 100 NMJs and the significant decrease in this ratio reflected NMJ denervation. We used Simple Neurite Tracer plugin in Image J software to quantify the total axon length of cultured neurons. For microglia morphology analysis, we used polygon selection tool to surround the projection of the cell bodies of Iba1-positive channel to calculate the soma area and roundness of microglia. Then we utilized the skeleton analysis method as previously reported  with minor modifications to estimate the length and number of branches per cell. In brief, we firstly visualized branches as many as possible, and then de-speckled noise signals to clear the background. After binary images were made, we used Skeletonize plugin in Image J, and then applied Analyze Skeleton plugin to calculate the length and number of skeletonized branches. Activated microglia represent larger soma size, decreased soma roundness and fewer branches. Total RNA was collected from neuron cultures or mouse tissue homogenates in Trizol reagent (Invitrogen, 15,596–018) and extracted as manufacturer’s instructions. The reverse transcription was carried out with PrimeScript RT Master Mix (TaKaRa, RR036A), and 500–1000 ng total RNA was used per reaction. We performed real-time PCR with SYBR green premix (Toyobo, QPK-201) and analyzed data on the StepOnePlus Real-Time PCR System (Applied Biosystems). β-Actin was used as internal control. ChIP Assay Kit (Upstate, 17–295) was used to perform ChIP assays according to the standard protocol in cultured cortical neurons. 200 base pairs ahead of the transcriptional start site were considered as the promoter region that interesting proteins bound. The sheared DNA samples were amplified and analyzed by real-time PCR. Signals were presented as the percentage of input. Anti-CREST (Willget) and anti-HDAC1 (Abcam, ab7028) antibodies were used in this experiment. IgG was the negative control. When CREST knockout mice and WT littermates were at the age of 12 months, rotarod tests were performed on a professional apparatus (Ugo Basile S.R.L.) every 2 weeks until 18 months. During this period, we used accelerating mode in which the rotating speed began at 8 rpm, and then elevated to 80 rpm in 300 s. At 18 months, we also performed fixed speed mode of rotarod tests on CREST knockout mice and WT littermates. In this mode, the rotating speed began at 20 rpm, and then lasted for 60 s. We also performed accelerating rotarod tests on Q394X knock-in mice at 12 or 18 months. We used two kinds of acceleration programs (4 to 40 rpm, or 8 to 80 rpm in 300 s). We performed three trials in each session and measured the time mice could hold on the rotating rod to indicate the motor function. The apparatus setup of beam walking test was produced as previously described . We chose the square beam whose side length was 12 mm for training and test sessions. After three training days, we performed two consecutive trials on each mouse and recorded with video camera in the test session. We analyzed the beam traversing time and the slip times of hind paws of both CREST knockout and Q394X knock-in mice at 18 months. In open field tests, mice were allowed to move freely in a 40 cm × 40 cm white box for 10 min. We analyzed the video recordings by the Ethovision XT software (Noldus) to measure the distance mice moved and the time mice stayed in the center region. We used CatWalk XT system (Noldus) to analyze the gait and locomotion of knockout mice. We chose a region of 20 cm length as the capture zone, and footprints could be visualized and analyzed when mice traversed this zone. The grip strength apparatus (Ugo Basile) was applied to measure the forelimb strength of knockout mice at 18 months. We used Graph Pad Prism 6 software (La Jolla) as the statistics tool to determine whether there were statistically significant differences between groups. Student’s t test was used in the analysis between two groups. One-way ANOVA was used between three groups. Two-way ANOVA was used in the analysis consisted of two factors. The meanings of p values are indicated as blow: *p < 0.05, **p < 0.01, ***p < 0.001, and ****p < 0.0001. To study protein properties of CREST-Q388X mutant, we constructed lentiviral vectors expressing cDNA of human WT CREST and Q388X mutant respectively, and infected lentivirus into primary cortical neurons isolated from embryonic C57BL/6 mice. Although there was no statistical difference between basal levels of CREST WT and Q388X mutant protein, we surprisingly found that the protein level of Q388X mutant was significantly reduced compared to WT if protein synthesis was blocked by cycloheximide (CHX) treatment, suggesting that protein stability of CREST-Q388X mutant is much lower compared to WT in cultured neurons in vitro (Fig. 1a and b). To further examine the role of CREST Q388X mutation in vivo, we constructed CREST knockout (KO) mice and the Q394X mice carrying point mutation Q394X in the Crest gene (the corresponding mutation of mouse CREST homolog for human CREST-Q388X) with CRISPR/Cas9 technology (Fig. 1c and d). Consistent with previous report, most of homozygous KO (Crest −/−) mice were lethal, and survivors were much smaller in size and had severe locomotion impairment compared to WT or heterozygous (Crest +/−) littermates (Fig. 1e) . We tested the protein level of endogenous CREST by performing Western blotting on samples collected from frontal cortices and lumbar spinal cords of Q394X and WT mice of 6 months old. Consistently, we found that protein level of CREST declined about 20% in brain and spinal cord of Q394X mice compared to WT mice, indicating that Q394X mutation leads to instability of endogenous CREST protein in vivo (Fig. 1f and g). Therefore, we suggest that CREST-Q388X mutant exhibits loss-of-function effects in causing ALS in human patients. To establish causal connection between loss of CREST and ALS pathogenesis, we set out to determine whether loss of CREST caused ALS-associated pathological features in vivo. Since homozygous Crest −/− mice could only survive less than one month, we examined histology markers in brain and lumbar spinal cord sections of Crest −/−, Crest +/− and WT mice at postnatal day 14 (P14). First, we found that the number of cholinergic (ChAT-positive) motor neurons in the ventral horn of lumbar spinal cord had no statistical difference between Crest −/−, Crest +/− and WT mice (Additional file 2: Figures S1A, S1B and S1C). Since inflammatory responses mediated by microglia in CNS have been implicated in numerous neurodegenerative diseases and motor neuron disorders, we would like to examine whether neuroinflammation was evoked in the absence of CREST. We measured inflammatory responses by immunostaining Iba1, the marker for microglia, in cerebral motor cortex and lumbar spinal cord of Crest −/−, Crest +/− and WT mice at P14. In terms of the overall cell number of Iba1-positive microglia, we did not detect alteration in either motor cortex or lumbar spinal cord of Crest −/−, or Crest +/− mice compared to WT littermates (Additional file 2: Figures S1D, S1E and S1F). However, we observed that Iba1-positive microglia represented activated morphological features, including enlarged cell bodies and less complex branches, in both lumbar spinal cord and motor cortex of CREST KO mice, compared to WT littermates (Additional file 2: Figures S1G-S1P). Moreover, we showed more dramatic decrease of the length and number of microglial branches in lumbar spinal cord and motor cortex of Crest −/− mice compared to Crest +/− littermates (Additional file 2: Figures S1J, S1K, S1O and S1P), validating the causality of CREST insufficiency with microglial activation. It was also worth to mention that we measured higher microglial activation level in spinal cord than in motor cortex of Crest +/− mice at P14 (Additional file 2: Figures S1J, S1K, S1O and S1P). We further performed immunohistochemistry analysis with Iba1 antibody in aged Crest +/− and WT mice at 6 months of age. Consistently, we observed morphological features of chronically activated microglia (increased soma area and decreased branch length or number) in both lumbar spinal cord and motor cortex in Crest +/− mice, but not in WT mice of the same age (Figs. 2a-j). Interestingly, we noticed that the complexity of microglial branches did not change in cerebral motor cortex of Crest +/− mice at P14, but at 6 months, significant decreases in branch length and number were detected in the same region, suggesting that the extent of microglial activation increases in Crest +/− mice with age (Fig. 2i, j, Additional file 2: Figures S1O and S1P). Taken together, we demonstrate that loss of CREST leads to microglial activation in the CNS of mice. Besides morphological analysis of microglia, we also tested expression levels of genes associated with neurotoxic proinflammation in Crest +/− and WT mice. Interestingly, we found a 2-fold upregulation of proinflammatory gene cyclooxygenase-2 (Cox-2, also known as Ptgs2), but not IL-1β (Il1b) or TNF-α (Tnfa), in cortical tissue of Crest +/− mice at 18 months of age (Fig. 2k). This result is consistent with previous reports showing increased expression of Cox-2 in both ALS patients and SOD1 mouse model [33, 34]. Together, we demonstrate that loss of CREST results in both microglial activation and the onset of proinflammatory processes in CNS. We further analyzed neurodegenerative phenotypes of both somatic and axonal morphology of motor neurons in lumbar spinal cord of Crest +/− mice and WT littermates at 6 months of age. Although there was no statistical difference in the number of ChAT-positive motor neurons in lumbar ventral horn between WT and Crest +/− mice (Fig. 2l and m), we found that the ratio of innervation of neuromuscular junctions (NMJs) in TA muscles significantly decreased in Crest +/− mice compared to WT littermates (Fig. 2n and o), suggesting a sign of axonal degeneration of motor neurons in lumbar ventral horn of Crest +/− mice. Moreover, we intend to determine whether loss of CREST directly leads to impaired axonal morphology in a cell-autonomous manner by analyzing some pathological features in primary cultured neurons in vitro. As an important hallmark of ALS, aberrant accumulation of protein inclusions in cellular cytoplasm may be toxic to neurons [35–37]. However, we did not find that the formation of YB1-positive stress granules under the treatment of sodium arsenite was influenced in isolated primary cortical neurons from embryonic CREST KO or WT littermates (Additional file 3: Figures S2A and S2B). To further illustrate dosage effects of CREST on axonal morphology, we transfected plasmids expressing short hairpin RNA (shRNA) of CREST  or human WT CREST cDNA into mouse primary cultured neurons and detected the axonal phenotype by immunostaining with axonal marker SMI312. We found that neither knockdown nor overexpression of CREST in neurons affected axonal length (Additional file 3: Figures S2C and S2D). Taken together, our results suggest that CREST deficiency may not cause cell-autonomous toxicity to neurons, and the denervation of NMJs may be caused by chronic microglial activation, proinflammatory responses or other causes. Next, we would like to determine whether inflammatory responses are also activated in CNS of Q394X mutant mice. After immunohistochemical analysis of Iba1-positive microglia in cerebral motor cortex and lumbar spinal cord of Q394X mice and WT littermates, we showed significant increase in soma area and decrease in soma roundness but no alteration of branch complexity of microglia in lumbar spinal cord of Q394X mice at 6 months, compared to WT littermates (Figs. 3a-e). Moreover, there were increase of soma area and decrease of length and number of branches of microglia in motor cortex of Q394X mice compared to WT at 6 months (Figs. 3f-j). 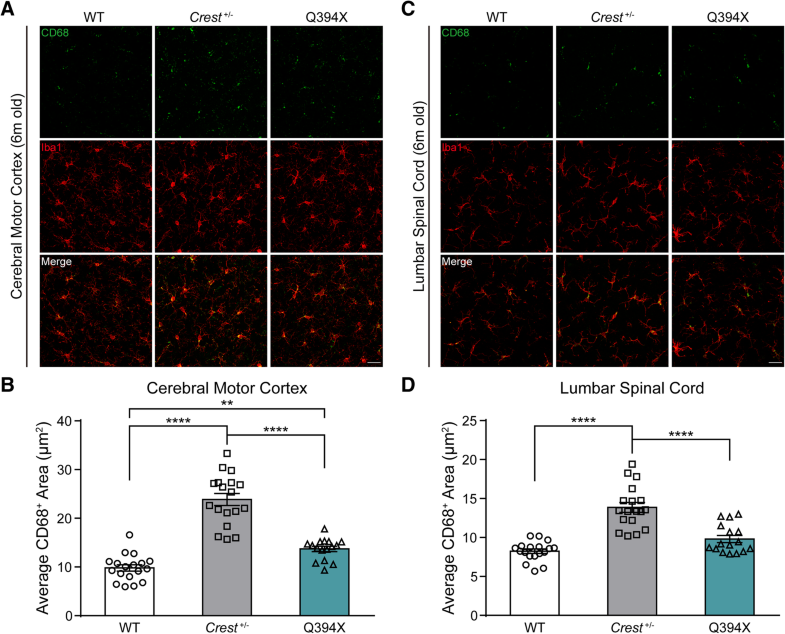 Therefore, we identified similar signs of increased inflammatory responses in motor cortex and lumbar spinal cord of Q394X mice, as they are in CREST haplosufficiency mice, suggesting that Q394X mice exhibits neuropathological symptoms in CNS. Besides morphological features indicating microglial activation, we would like to further validate the finding by examining the signal of CD68, which is a typical biomarker of activated macrophages, including microglia. After performing immunohistochemical analysis of CD68 signal area per microglia, we found that CD68 signals significantly increased in cerebral motor cortex of both Crest +/− and Q394X mice compared to WT at 6 months (Fig. 4a and b). As for lumbar spinal cord, we observed distinct upregulation of CD68 in Crest +/− mice and a mild but not significant increase of CD68 staining in Q394X mice compared to WT at 6 months (Fig. 4c and d). Furthermore, there were more CD68 signals both in cerebral motor cortex and lumbar spinal cord of Crest +/− mice compared to Q394X mice (Figs. 4a-d). Thus, we confirmed microglial activation both in Crest +/− and Q394X mice by CD68 staining, and consistent with the extent of CREST deficiency, Crest +/− mice have more activated microglia compared to Q394X mice. 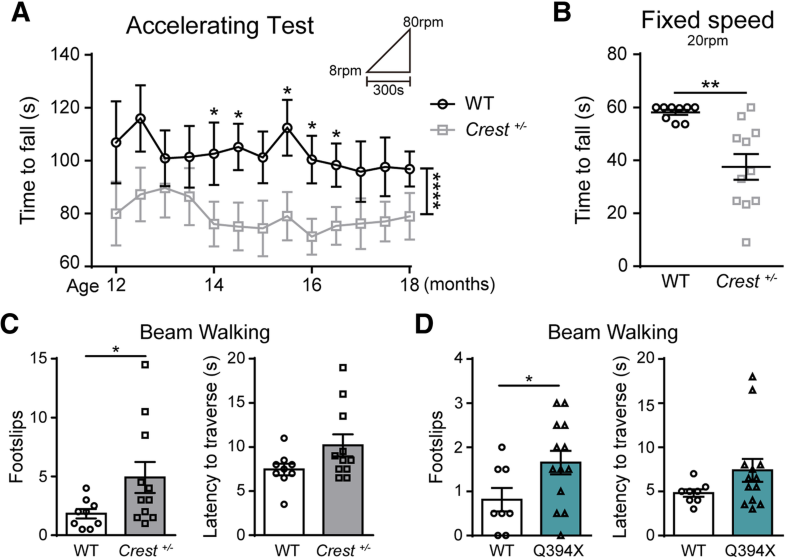 To determine whether Crest +/− or Q394X mice may exhibit ALS-like motor defects, we performed a battery of behavioral tests including open field, footprint, grip strength, rotarod and beam walking  on Crest +/− mice and WT littermates. Crest +/− mice appeared to be generally healthy during 12 to 18 months of age (Additional file 4: Figure S3A), and exhibited no defects in open field test (Additional file 4: Figure S3B). Although we observed increased width of front foot bases (Additional file 4: Figure S3C) and decreased forelimb strength (Additional file 4: Figure S3D) of Crest +/− mice at 18 months, the difference was not significant enough in footprint and grip strength tests (Additional file 4: Figures S3C and S3D). However, we found that Crest +/− mice started to exhibit deficits of motor coordination in the accelerating rotarod test from 14 months of age (Fig. 5a). Moreover, Crest +/− mice fell more easily from rotating rod than WT littermates in the fixed speed task of rotarod test (Fig. 5b). In beam walking test, Crest +/− mice showed significantly more slipped steps compared to WT mice (Fig. 5c, Additional file 5: Video S1 and Additional file 6: Video S2), indicating that motor coordination abilities of Crest +/− mice are indeed compromised. We further examined motor phenotypes of Q394X mice at 18 months of age. The general body weight and health of Q394X mice were also normal (Additional file 7: Figure S4A). Although exhibiting no defects in open field and rotarod tests (Additional file 7: Figures. S4B and S4C), Q394X mice also showed more foot slips in beam walking test compared to WT littermates (Fig. 5d, Additional file 8: Video S3 and Additional file 9: Video S4), indicating similar impairment of motor phenotypes in Q394X mice as in Crest +/− mice. Taken together, we demonstrate that both haploinsufficiency and Q394X mutation of CREST can lead to elevated inflammatory responses in CNS and deficits in motor coordination in vivo. Prior to the investigation of molecular mechanisms underlying increased inflammatory responses in CREST deficient mice, we sought to determine expression pattern of CREST in CNS. According to the data from Brain RNA-Seq database  and previous report, CREST is highly expressed in neurons compared to other cell types in both human and mouse CNS (Additional file 10: Figure S5A) . We confirmed this conclusion by performing immunohistochemistry experiments with various antibodies in cerebral motor cortex and lumbar spinal cord of adult WT mice. In agreement with previous data, we found that CREST mostly was not expressed in Iba1-positive microglia either in motor cortex or lumbar spinal cord (Additional file 10: Figures S5B and S5C). However, CREST showed some expression in GFAP-positive astrocytes in white matter of lumbar spinal cord but not in motor cortex of WT mice (Additional file 10: Figures S5B and S5C). Therefore, we suggest that neuronal loss of CREST may contribute to the microglial activation in CNS. Given the fact that CREST is a critical transcriptional regulator , we examined gene expression profiles by performing microarray analysis in primary cortical neurons infected with lentivirus harboring shRNA targeting CREST or control shRNA (Fig. 6a and Additional file 11: Figure S6B). Using DAVID bioinformatics resources online (https://david.ncifcrf.gov) [40, 41], we performed gene ontology (GO) analysis of microarray data and surprisingly found that most significantly affected genes were predominantly associated with immune-associated processes (Fig. 6b), suggesting the role of CREST in regulating expression of genes related to inflammatory responses. Among top 10 of the most remarkably upregulated genes, we selected two important chemokines, Ccl2 and Cxcl10, which have been reported to play critical roles in microglial activation and inflammatory responses, for further analysis [42, 43]. We first confirmed that mRNA levels of Ccl2 and Cxcl10 were significantly upregulated in CREST knockdown neurons compared to control neurons with real-time PCR (Fig. 6c). Moreover, we observed a significant decrease in mRNA level of Cxcl10 in CREST overexpressing neurons (Additional file 11: Figures S6C and S6D). We then examined expression levels of endogenous Ccl2 and Cxcl10 in primary cortical neurons isolated from embryonic cortices of Crest −/− (Additional file 11: Figure S6A), Q394X and WT mice, respectively. Importantly, we found that mRNA levels of both Ccl2 and Cxcl10 were markedly higher in Crest −/− and Q394X neurons compared to WT littermates, respectively (Fig. 6d and e). Thus, we demonstrate that neuronal loss of CREST leads to altered expression of immune-related genes, such as the upregulation of chemokines Ccl2 and Cxcl10, which may contribute to microglial activation and elevated inflammatory responses. To further reveal molecular mechanism underlying the regulation of Ccl2 and Cxcl10 in neurons by CREST, we hypothesized that CREST inhibited transcription of these two genes through the BRG1-CREST complex recruiting histone deacetylases such as HDAC1 . To test this hypothesis, we performed chromatin immunoprecipitation (ChIP) experiments in cultured neurons with anti-CREST and anti-HDAC1 antibodies. Indeed, we found that both CREST and HDAC1 interacted with promoter regions of Ccl2 and Cxcl10 genes (Fig. 6f). Moreover, mRNA levels of Ccl2 and Cxcl10 were increased in BRG1 knockdown cortical neurons by lentiviral shRNA transfection (Additional file 11: Figures S6E and S6F) compared to control neurons (Fig. 6g). Consistently, we detected significantly upregulated mRNA levels of Ccl2 and Cxcl10 in neurons treated with an HDAC inhibitor trichostatin A (TSA) compared to controls (Fig. 6g). Taken together, we suggest that the CREST-BRG1 complex plays a critical role in inhibiting transcription of Ccl2 and Cxcl10 in neurons via HDAC-dependent histone deacetylation. Besides the regulation of immune-related genes by CREST in neurons, we also wonder whether CREST can influence the expression of other important ALS-linked genes, such as FUS which has been reported as a CREST-binding protein  and TDP43. We performed immunohistochemistry with anti-FUS antibody in cerebral motor cortex and lumbar spinal cord sections of Crest −/−, Crest +/− and WT littermates at P14. Interestingly, we found that protein level of FUS was stringently correlated with CREST, and gradually decreased in both motor cortex and lumbar spinal cord of Crest +/− and Crest −/− mice compared to WT littermates (Fig. 7a and b). Furthermore, we found that protein level of FUS rather than TDP43 was modestly decreased both in frontal cortices and lumbar spinal cords collected from Crest +/− mice compared to WT littermates at 18 months of age (Fig. 7c and d). 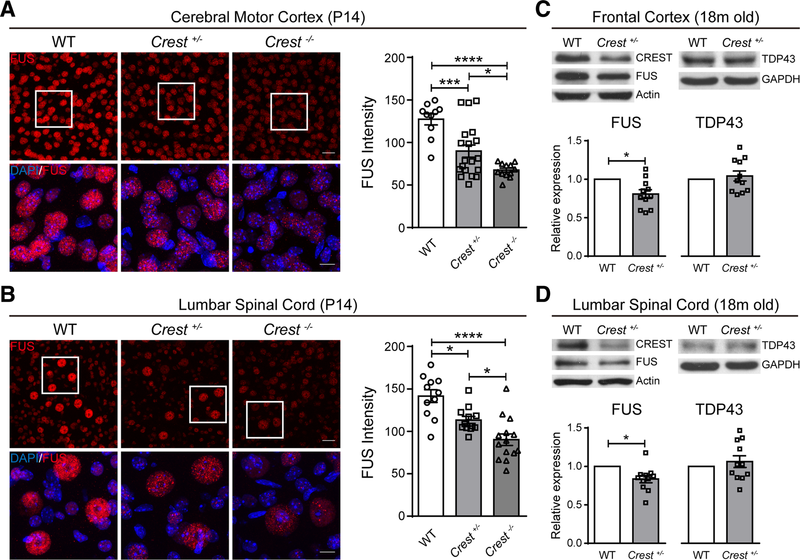 These data reveal that FUS may be loss-of-function in CREST mutant mice, further suggesting a converged pathway for ALS pathogenesis from different genetic causes. (A and B) Representative confocal immunohistochemistry images (left panels) and intensity quantification (right graphs) of FUS (red) in the cerebral motor cortices (a) and the lumbar spinal cords (b) of Crest −/− (n = 3), Crest +/− mice (n = 3) and WT littermates (n = 3) at P14. Each symbol indicates one image. Top panels show lower magnification, scale bar = 25 μm. Bottom panels show higher magnification of the white square regions of upper panels, scale bar = 10 μm. Error bars represent SEM. *p < 0.05, ***p < 0.001, and ****p < 0.0001, one-way ANOVA. (C and D) Immunoblot (top panels) and intensity quantification (bottom graphs) of protein from the frontal cortices (c) and the lumbar spinal cords (d) of Crest +/− mice (n = 11) and WT littermates (n = 5) at 18 months of age. Relative expression represents the normalized ratios of FUS/Actin (bottom left graphs) or of TDP43/GAPDH (bottom right graphs) band intensities determined by densitometry in Image J. Error bars represent SEM. *p < 0.05, Student’s t test. Numerous publications have illustrated that chronic proinflammatory responses contribute to pathogenic mechanisms underlying the progression of neurodegenerative diseases. In this study, we reveal that microglial appearance exhibits activation morphology including the enlargement of cell bodies and the decreased complexity of branches in both CREST KO and Q394X mutant mice. Since the differentiated subsets of activated microglia, including proinflammatory (M1) and antiinflammatory (M2) microglia , we detected the expression of some inflammatory genes in Crest +/− mice and WT littermates at 18 months and found a specific upregulation of proinflammatory gene Cox-2, suggesting overall effects of CREST haploinsufficiency on chronic activation of neurotoxic M1 microglia, which may cause the axonal degeneration of motor neurons in spinal cord. Although the increased expression of Cox-2 in ALS patients and SOD1 mutant mice has been reported , one more interesting discovery is that the expression of Cox-2 is specifically increased in ALS patients rather than other neurodegenerative disease cases . Moreover, inhibition of enzymatic activity of COX-2 may delay disease onset and ameliorate the survival of ALS mice [45, 46], suggesting that chronic activation of M1 microglia and concomitant upregulation of Cox-2 caused by loss of CREST contribute to ALS pathogenesis. Consistent with axonal degeneration in CREST haploinsufficiency mice, we found that both Crest +/− and Q394X mice exhibited deficits in motor coordination tasks, further confirming the connection between CREST and ALS pathogenesis. However, we did not detect very serious neurodegenerative phenotypes as in SOD1 mutant transgenic mice. Considering the involvement of both genetic and environmental factors in pathogenesis of ALS, we may try some artificial manipulations, such as the administration of lipopolysaccharide (LPS), in CREST KO or mutant mice to induce more significant inflammatory responses and anticipate the appearance of more typical ALS symptoms . Microarray analysis suggests the altered expression of many immune-related genes, such as upregulation of chemokines Cxcl10 and Ccl2, in CREST deficient or ALS-related mutation Q388X-expressing neurons. Moreover, we demonstrate that CREST may directly inhibit the transcription of Cxcl10 and Ccl2 genes through the CREST-BRG1-HDAC1 complex interacting with promoter regions . 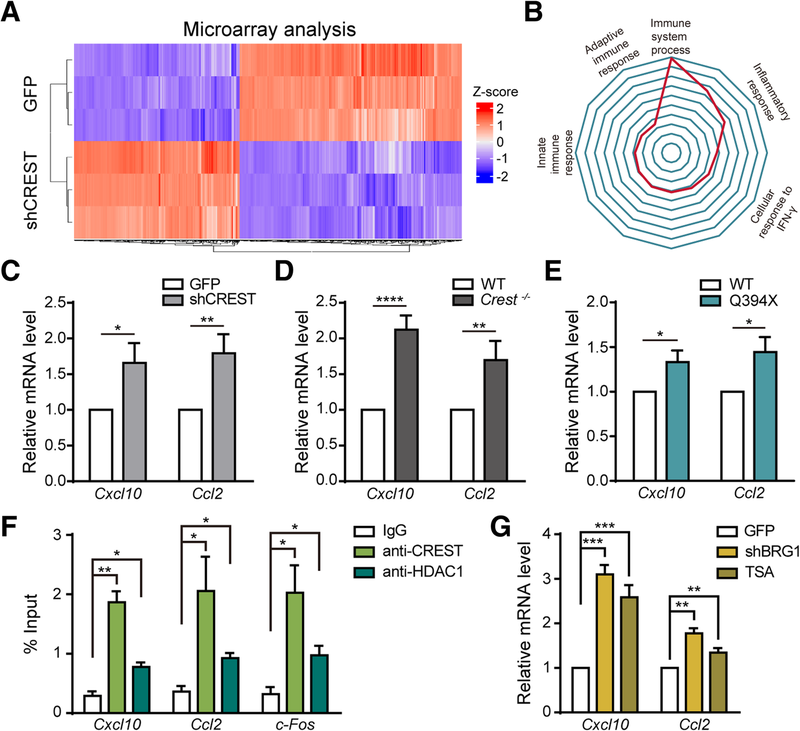 Comprehensive regulation of immune-associated genes by CREST may play critical roles in microglial activation and proinflammatory responses, and the upregulation of chemokine genes is part of these transcriptional alterations. Consistent with the notion that upregulation of chemokines in CNS may contribute to the infiltration of periphery immune cells, increased expression of Ccl2 in SOD1 mutant transgenic mice or ALS patients has been reported to induce the infiltration of dendritic cells and promote the acquisition of properties of antigen-presenting cells by microglia [48–50]. In this sense, it may be the involvement of multiple immune processes, possibly including T cell infiltration, that contributes to microglial activation and proinflammatory responses in CREST mutant mice. Another interesting pathological phenotype we observed in CREST KO mice is the decreased protein level of FUS in CNS, although the reduction is quite modest. Previous publications have shown that knockdown of FUS can reduce cell viability in vitro, and cause anatomical loss of neuromuscular junctions and concomitant impairment of locomotion ability in Drosophila and zebrafish models [51–53], suggesting that besides neurotoxic proinflammation induced by microglial activation, the loss of FUS may also contribute to the degeneration of motor neurons in CREST KO mice. 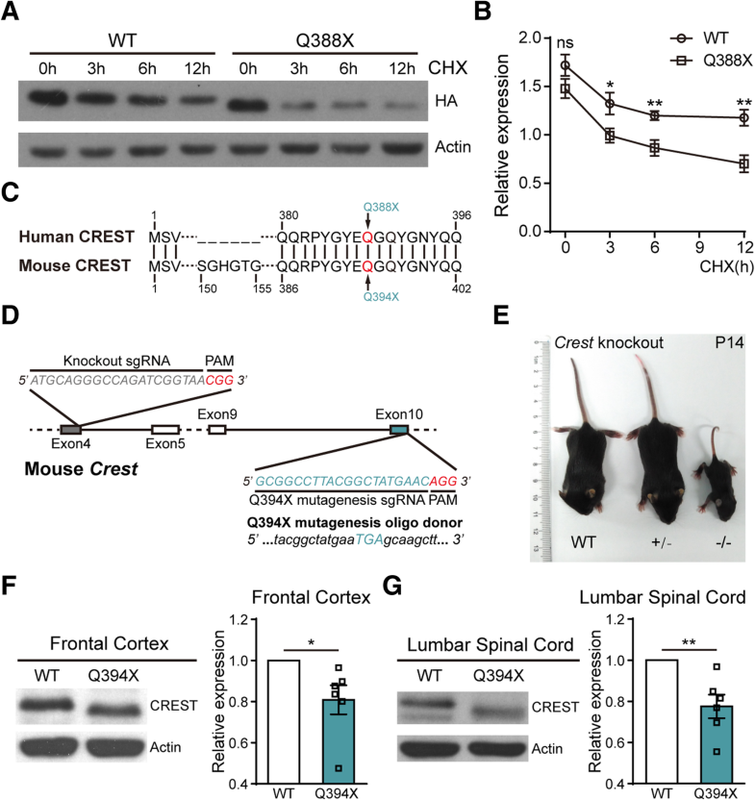 We demonstrate that CREST is a pathogenic gene for ALS, mutations of which lead to upregulation of chemokine genes in neurons, subsequently activate microglia, increase proinflammatory responses in vivo, and ultimately impair motor function in aged CREST KO and Q394X mutant mice. These data provide a transcriptional pathway for neuroinflammation activation in ALS, suggesting that approaches of modulating histone deacetylase complex may be the candidates for therapeutic intervenes. We thank ION transgenic core facility for making CREST knockout and Q394X mutant mice in this work. This work was supported by NSFC Grants (#31625013, #91732302) and Shanghai Brain-Intelligence Project from STCSM (16JC1420501). The research is supported by the Open Large Infrastructure Research of Chinese Academy of Sciences. Z.Q. conceived and supervised the project. C.C. performed most parts of experiments and data analysis. K.Y. and X.W. performed parts of biochemistry experiments. Y.Z. managed mice for experiments. S.S. isolated primary neurons. A.Ghosh contributed to conditional CREST mice construction. A.Gitler contributed to the genetic data containing CREST Q388X mutations. Z.Q. wrote the manuscript. All authors read and approved the final manuscript. All animal-involved experiments were approved by the Biomedical Research Ethics Committee at the Shanghai Institutes for Biological Science (CAS). The use and care of animals were in accordance with the guidelines of this committee.